April 4, 2017 Jeff 2 comments. 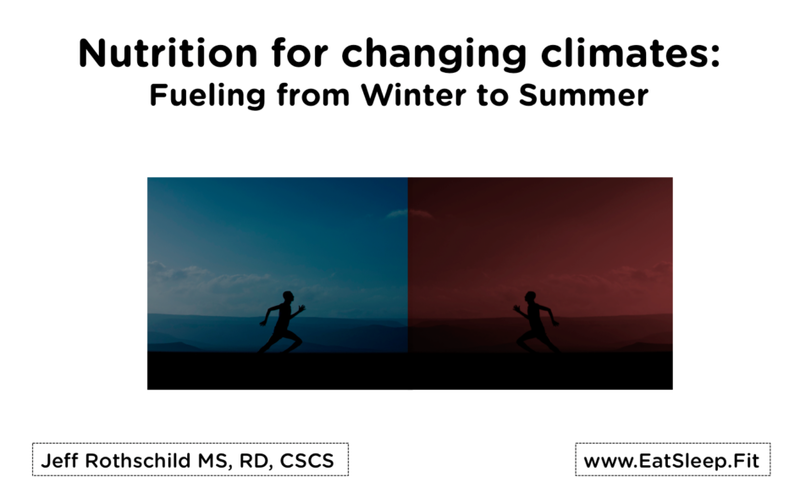 Nutrition needs for athletes are greatly affected by things like temperature, humidity, altitude, and the length of the workout or race, as well as by the amount of time spent acclimating in a new environment. This becomes relevant for us during the Spring when we might have moderate weather mixed in with some hot spells, or when traveling to races in other parts of the country like Ironman Texas in April, or some of the more humid areas of the East coast. I recently gave a talk on this subject to LA tri club in Santa Monica, and wanted to share some of the key points from the talk. 1:35 Why do we sweat? 2:36 How much do we sweat? This is awesome info. I’m training with triathletes and train in summer hot and cold winter. Interesting info on coconut water. Never thought about that. Thanks Miguel, glad you found it helpful!